If you enjoy the bright, crisp colors of a tree during the peak fall season, the liquid amber tree may become a new favorite – if it isn't already. 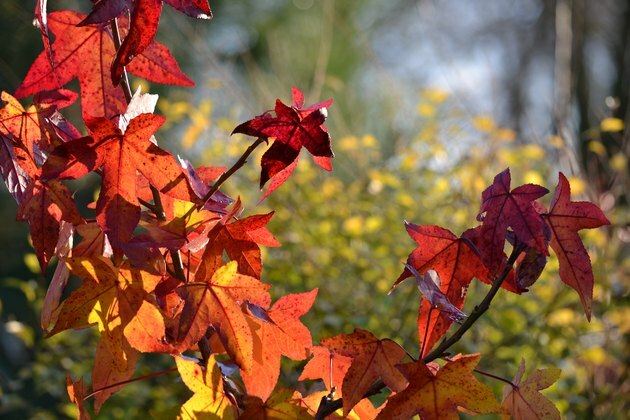 Whether you're looking to add new foliage to your yard or you're lucky enough to have one already on your property, the liquid amber, or sweetgum tree, is sure to delight. A hearty tree that's fairly easy to care for, you can enjoy the vivid colors and sweet sap of a liquid amber tree for years by keeping just a few of its core needs in mind. Liquid amber trees are plants native to the southeastern region of the United States, Mexico and parts of Central America. According to the Arbor Day Foundation, they can reach heights of 60 to 75 feet tall and can spread up to 50 feet across, which is why they require ample space for their roots and branches to develop. The liquid amber tree is known for the bright foliage it produces in the fall and its pointed, pyramid-like shape, which usually rounds out over time and can sometimes resemble a teardrop. Liquid amber is sometimes referred to as liquidambar, for its scientific name, Liquidambar styraciflua, or, more commonly, sweetgum, for the sweet-smelling, amber-colored resin it produces. Caring for a liquidambar tree is relatively easy once you understand what one needs to thrive and then provide those things for it to do so. First thing's first, liquidambar trees are naturally found growing in the southern parts of the northern hemisphere, so that means warm temperatures and lots of sunlight are must-haves to get these trees to grow big and strong. Liquidambar can tolerate dry soil but does best in conditions that are hydrated yet properly drained like sandy or clay-type soil that's acidic (avoid swampy, stagnant earth). If you've recently planted a new liquidambar tree in your yard, be sure to give it a little extra water during the early growth stages. Do the same for your tree regardless of its age if temperatures soar, which can cause your tree to dehydrate. When it comes to feeding your liquidambar tree, any all-purpose fertilizer or manure should do the trick, but there's one thing more important than plant food that will help your tree thrive. Adding an inch or two of mulch to the top of the soil in which your liquidambar tree is planted will help maintain the proper water levels needed for your tree to grow. If you have a new or young liquid amber tree in your care, you can expect growth to be slow but steady. The most important thing to consider when caring for and raising your liquid amber tree is to allow for plenty of room for its roots to grow. Nature & Garden recommends planting liquid amber trees in the fall, which will allow for proper root formation before the cooler winter months hit, but you can also plant them in the spring if you purchased a young tree that's housed in a container. Once mature, liquid amber trees make seeds that several varieties of birds, such as finches and wild turkeys, enjoy snacking on. Other small animals, such as chipmunks and squirrels, also enjoy eating the fruit that the liquid amber tree produces, which are hidden in tough, burr-covered pods that hang from the tree's branches. As liquid amber trees continue to grow, their branches and leaves will spread outward so the shape is wider in the middle or near the bottom than it is at the top. You may be tempted to trim the tree as it grows, but when it comes to liquidambar, pruning isn't recommended. Instead, simply remove any dead or damaged branches as you see them pop up, which will encourage a healthy growth pattern among the rest of the plant.